How do you celebrate your relationships? Welcome to the April Cross Canada Hop where we are celebrating! What are we celebrating? Life! Love! Friendship! Whatever you want. As you go through our hop this month, take a moment to think about everything in your life and how you would celebrate it all. Please leave comments for us as you go, whether it is a comment about our artwork or about your own celebrations, we would love to hear it. If you got here from Brae's blog, you are on the right track, but if you get lost along the way, just go back to Michelle in Nova Scotia where you will find the complete list of hoppers. When I started thinking about everything in my life, I had no problem figuring out what I want to celebrate. My hubby and I have been together for 29 years, not all of them great. We have had our share of not so loving times, but we worked around them and got through it all. There was a time when I would gladly have packed everything I own and moved out, never to go back. But as they say, marriage is tough. You don't throw something out if is broken but can be fixed. So we worked on fixing our relationship and today, we have a better marriage than ever. We still have our moments but all-in-all, it is good. 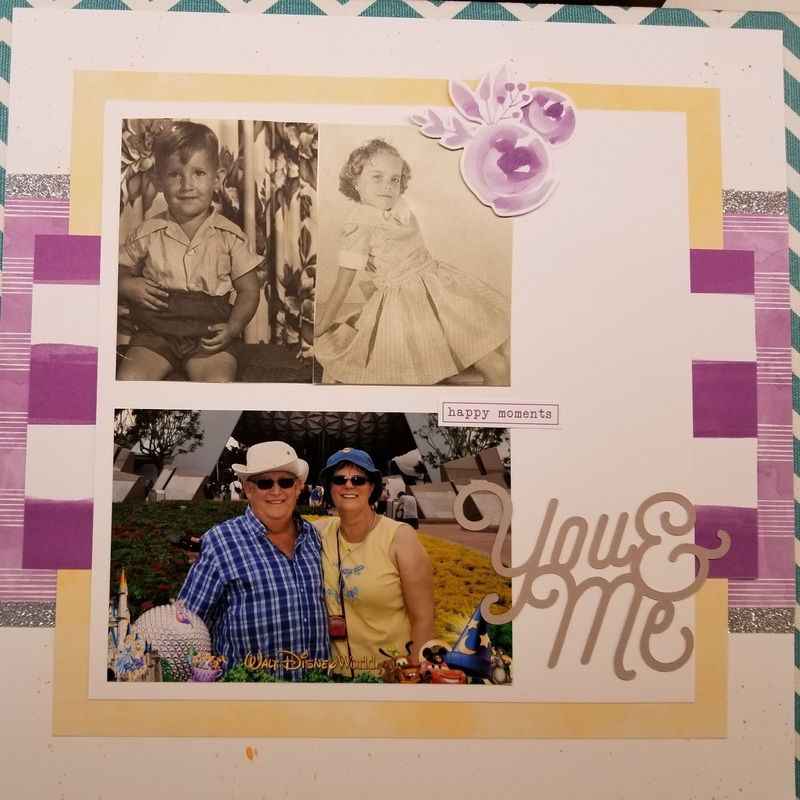 I made a layout centered on my hubby and me. No other family in this one. This is a celebration of who we are and what we have become. The layout is my version of the one shown on page 36 of the 2017/2018 Idea Book. The two B&W photos are my hubby, Dwayne, and myself at 4 years old, and then here we are at Disney World for the CTMH Convention in 2013. That was a blast! I still need to add my journalling in that space on the right but my pen has run dry so until I get a new one, that will need to wait.